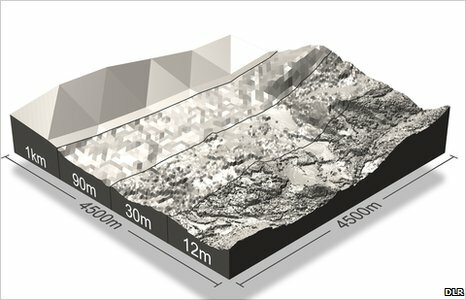 Terrain Bender applies progressive bending to digital terrain models for 3D cartography. It offers interactive tools to add a bent base to a digital terrain model. Terrain Bender is free and open-source software. Version 1.0.4 of 24 November 2009 is available for Windows, Mac OS X and Linux. Please see the system requirements, and download an example terrain model. 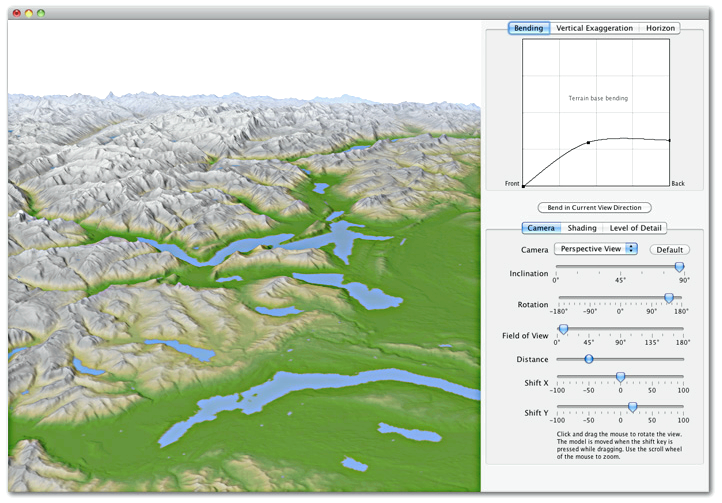 3D maps with progressive bending show the landscape using a varying viewing angle from steep in the foreground to flat in the background. The result is similar to the way in which passengers in a plane perceive the landscape, first looking straight downwards and then raising their gaze towards the horizon. Terrain Bender offers specialized tools for bending terrain models. Terrain Bender features interactive previews of 3D maps, but final rendering is best done with ray-tracing software. 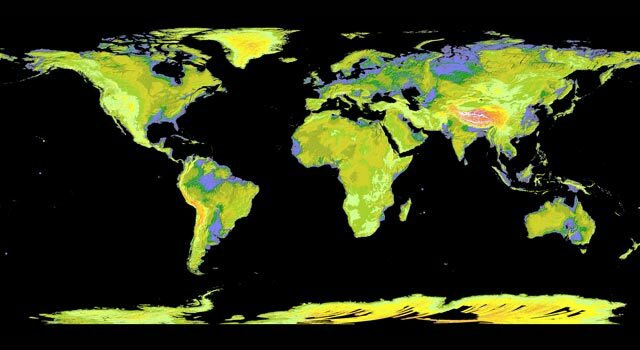 PASADENA, Calif. – NASA and Japan released a new digital topographic map of Earth Monday that covers more of our planet than ever before. The map was produced with detailed measurements from NASA’s Terra spacecraft. According to Mike Abrams, Aster science team leader at NASA’s Jet Propulsion Laboratory in Pasadena, Calif., the new topographic information will be of value throughout the Earth sciences and has many practical applications. “Aster’s accurate topographic data will be used for engineering, energy exploration, conserving natural resources, environmental management, public works design, firefighting, recreation, geology and city planning, to name just a few areas,” Abrams said. Previously, the most complete topographic set of data publicly available was from NASA’s Shuttle Radar Topography Mission. That mission mapped 80 percent of Earth’s landmass, between 60 degrees north latitude and 57 degrees south. The new Aster data expand coverage to 99 percent, from 83 degrees north latitude and 83 degrees south. Each elevation measurement point in the new data is 30 meters (98 feet) apart. NASA and METI are jointly contributing the Aster topographic data to the Group on Earth Observations, an international partnership headquartered at the World Meteorological Organization in Geneva, Switzerland, for use in its Global Earth Observation System of Systems. This “system of systems” is a collaborative, international effort to share and integrate Earth observation data from many different instruments and systems to help monitor and forecast global environmental changes. NASA, METI and the U.S. Geological Survey validated the data, with support from the U.S. National Geospatial-Intelligence Agency and other collaborators. The data will be distributed by NASA’s Land Processes Distributed Active Archive Center at the U.S. Geological Survey’s Earth Resources Observation and Science Data Center in Sioux Falls, S.D., and by METI’s Earth Remote Sensing Data Analysis Center in Tokyo. Data users can download the Aster global digital elevation model at: https://wist.echo.nasa.gov/~wist/api/imswelcome and http://www.gdem.aster.ersdac.or.jp . I went out to the Smithsonian’s Udvar-Hazy Air and Space museum annex at Dulles International Airport in Chantilly, Virginia last weekend and was pleasantly surprised to see one of the SRTM payloads hanging off the ceiling. The Shuttle Radar Telemetry Mapping program helped produce a significantly more accurate and detailed world-wide digital elevation model (DEM, DTM) in the early part of this decade and was a great leap forward for shaded relief generation. If you make the trip, you’ll find the SRTM between 22 and 23 on the map below in the “space shuttle” hanger. 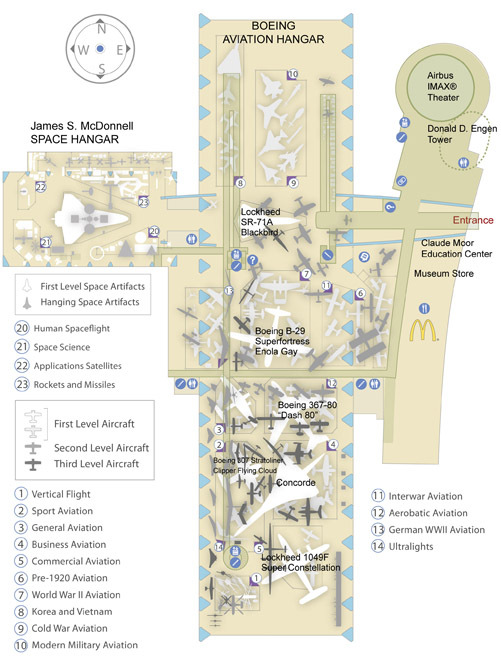 The map does a good job of indicating what altitude different aircraft can be found in the hanger. In 2000, the Shuttle Endeavor carried the Shuttle Radar Topography Mission (SRTM) payload into orbit. Shuttle astronauts used the payload, manufactured by the AEC-Able Engineering Co., to map in high detail and three dimensions more than 70 percent of the Earth’s surface–the most complete and accurate rendering of the planet’s land masses ever attempted. The Museum possesses two components–the mast canister (this artifact) and the outboard support structure with its antennas–crucial to that mission. To acquire this data, the SRTM used a novel hardware system that featured a main antenna located in the Shuttle payload bay, a folding mast (in the mast canister) that extended 60 meters from the Shuttle, and then another antenna system that was positioned at the end of the mast (the outboard structure). 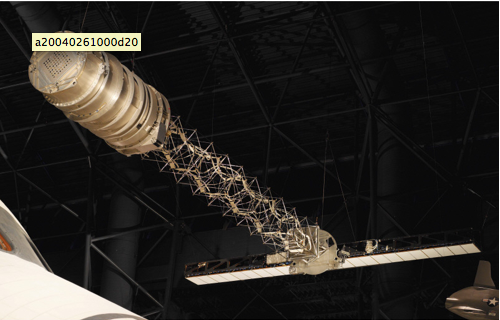 It was this dual antenna system–the largest rigid structure then flown in space–that produced, through interferometry (a technique for combining the information obtained from the two, separate antennas), a three-dimensional mapping of the Earth. The mission was a joint undertaking of NASA’s Jet Propulsion Laboratory and the Department of Defense’s National Imagery and Mapping Agency. The military will use the highest resolution data from SRTM for terrain navigation for planes and cruise missiles. A lower resolution data set will be made available to civilian scientists and other users. NASA transferred these artifacts to the Museum in 2003.